Everything you thought you knew about cooking pasta is wrong. When I took cooking classes in Italy, they taught me to bring a large volume of salted water to a rolling boil, add a drop of olive oil so that the noodles wouldn't stick together, and wait several minutes until it was al dente (which literally means "to the tooth," i.e., firm and not mushy when bitten). I bet the method you learned is pretty similar. But in this brave new world of cooking, people out there are breaking all the rules and coming up with revolutionary ways to cut down on cooking time when it comes to pasta. The techniques below used standard semolina durum pasta. Experiment with whole wheat, brown rice, and kamut/spelt pastas at your own risk. 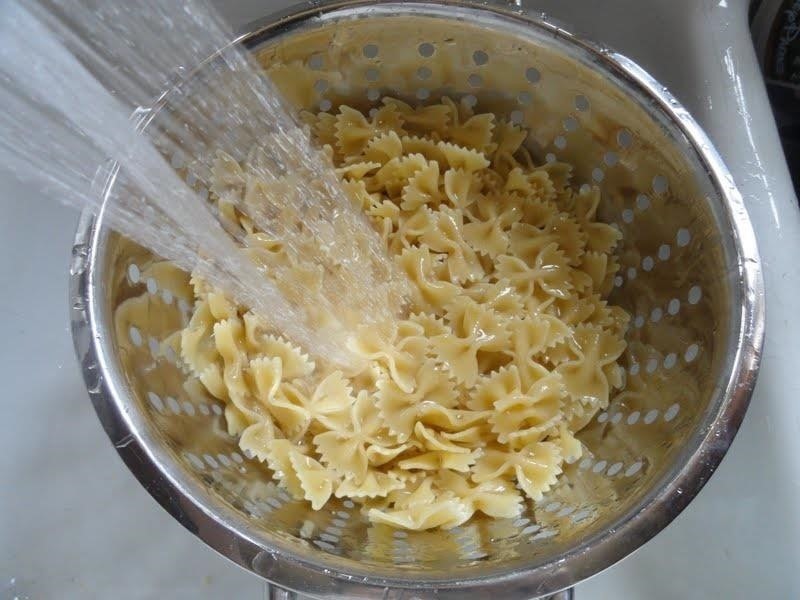 Aki Kamozawa and H. Alexander Talbot of Ideas in Food discovered that soaking pasta in cold water for 90 minutes significantly cut down on cooking time. Why? In order to become fully cooked, pasta needs to absorb water to become fully pliable, while heat activates the starch and helps it to become more gel-like. With a cold-water soak, the starch in the pasta doesn't get activated, which means the noodles soak up water without getting gummy. It becomes more like freshly made pasta, which usually only takes a minute or two to cook. Kamozawa and Talbot brought a large pot of water to boil and added the soaked noodles. They cooked in one minute and came out al dente. One thing to note from commenters on the site who tried the technique is that although the pasta cooks just fine, it has less "yield," which means it doesn't plump the way pasta normally does when completely cooking in boiling water. This means the portions may look significantly smaller on the plate than people might expect. In my home experiments, I found that this soaking method worked beautifully. In the first test, I soaked the pasta and then boiled fresh water for cooking. In the second test, I used the soak water for cooking the pasta, too. 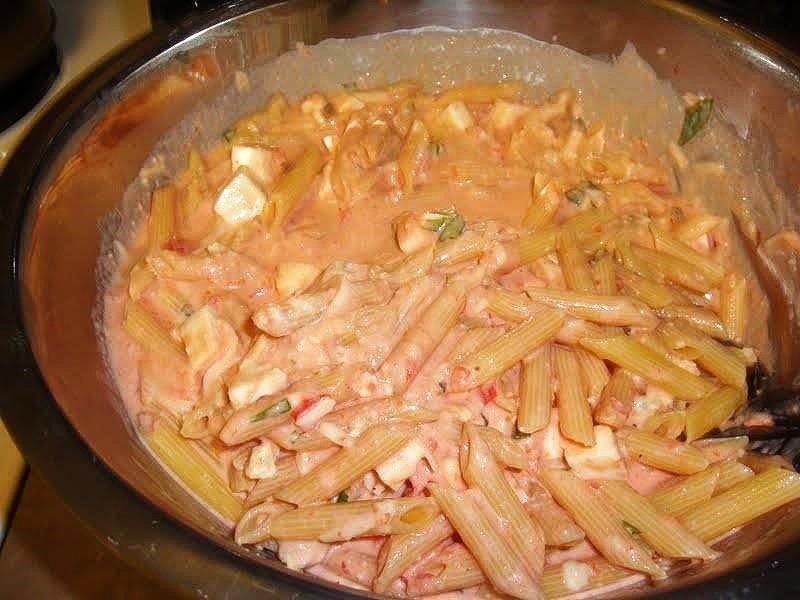 I found that the second batch had more flavor, perhaps because it retained a lot of the starch from the soaked pasta. You can soak your pasta in a covered container or a plastic bag, whatever works for you. In both cases, I found that a cooking time of 30 to 45 seconds sufficed, especially if you like a more al dente texture. 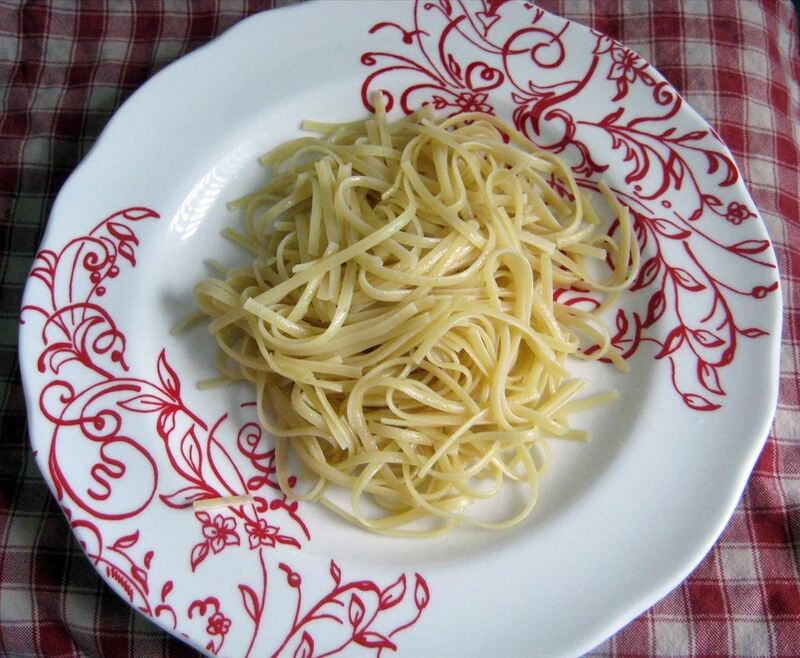 The fact that the pasta had less yield didn't seem significant on the plate, either. Cooked for 30 to 45 seconds, the soaked pasta was wonderfully al dente. Over at Chef Talk, thetincook points out that you can add spices/herbs to the soak to flavor the pasta, the same way you might brine a piece of meat. You can read more about the pre-soak method here. 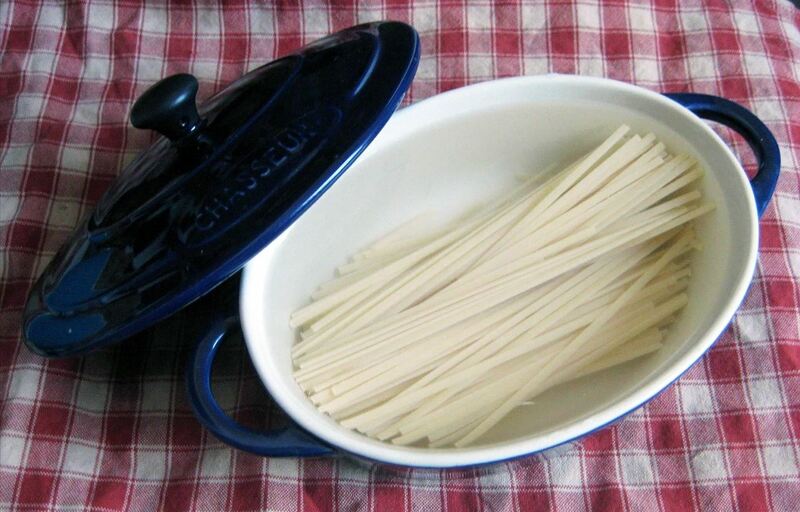 An old restaurant trick is to parboil pasta (as in cook it partially) and then store it. When a slew of customers order linguine alle vongole (that's pasta with clams to you and me), they can then have several dishes of pasta ready in a few minutes. You can parboil almost anything, including vegetables, rice, and ribs, according to The Joy of Cooking. Parboiling is pretty easy. Bring salted water to a rolling boil, then add the amount of pasta you desire. 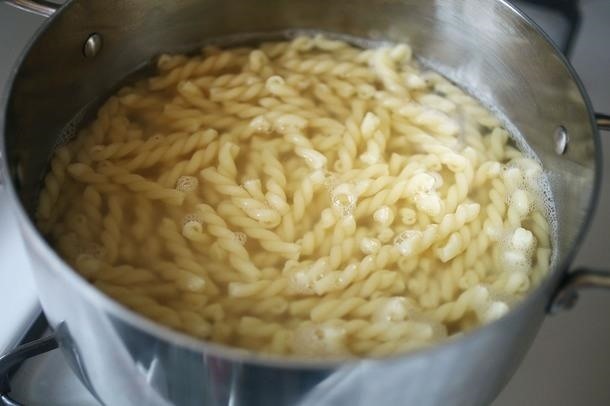 Skip Lombardi of All Things Frugal recommends you wait until the water starts boiling again, let the pasta cook for exactly two minutes, take the pasta out of the water, and run it under cold water to stop the cooking process. The pasta will keep for up to six hours. He recommends you add a little olive oil to coat the pasta. To cook it until it's done, bring salted water to a boil and add the par-cooked pasta (it's fine if it's gone a little soft). Check after one minute. Most likely, the pasta will be done. If not, it may require another minute. Get the full instructions here. My method is a little lazier. I bring water to a boil and then add pasta. I check on it after about three or four minutes. When the pastas is still a little crunchy but just about to soften, I turn off the heat, drain it, and plunge it in an ice water bath. Then I store it with a little olive oil and some chopped garlic for extra flavor. My re-cooking methods hew pretty closely to Lombardi's, except sometimes I skip boiling water the second time around and instead finish the pasta by bringing my pasta sauce to an enthusiastic simmer and cooking it in there. I feel it absorbs more flavor that way. Kate Heyoe, author of Cooking Green: Reducing Your Carbon Footprint in the Kitchen, advocates a method where you cook your pasta in boiling water until the last two minutes. 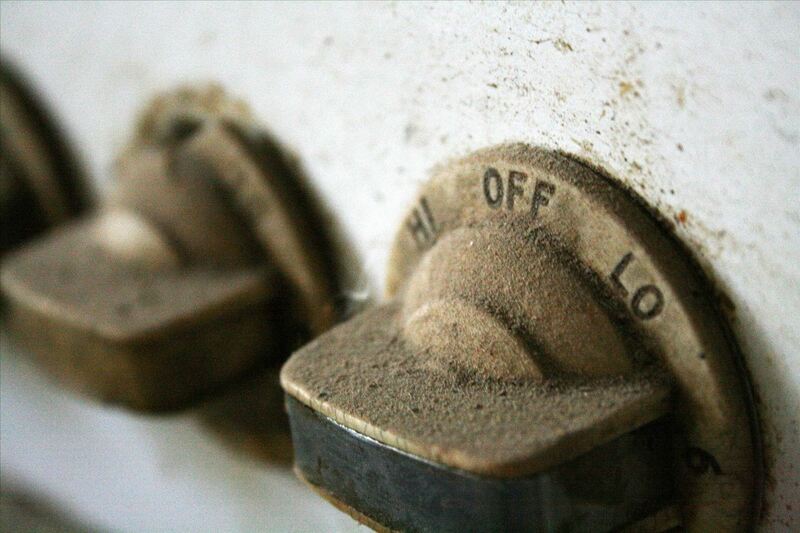 At that point, you turn off the gas or electricity and let the residual heat do the cooking for you. I've often used this method when baking and roasting and flip the oven to off for the last five minutes of the recommended cook time, but I never thought to do it for pasta. This method also works to blanch veggies, too. Harold McGee, after much trial and error, discovered that you can cook a pound of pasta in 1½ to 2 quarts of water rather than the usual package recommendations of 4 to 6 quarts. He points out that this saves a significant amount of precious H2O and is a big savings to your energy bill, too. 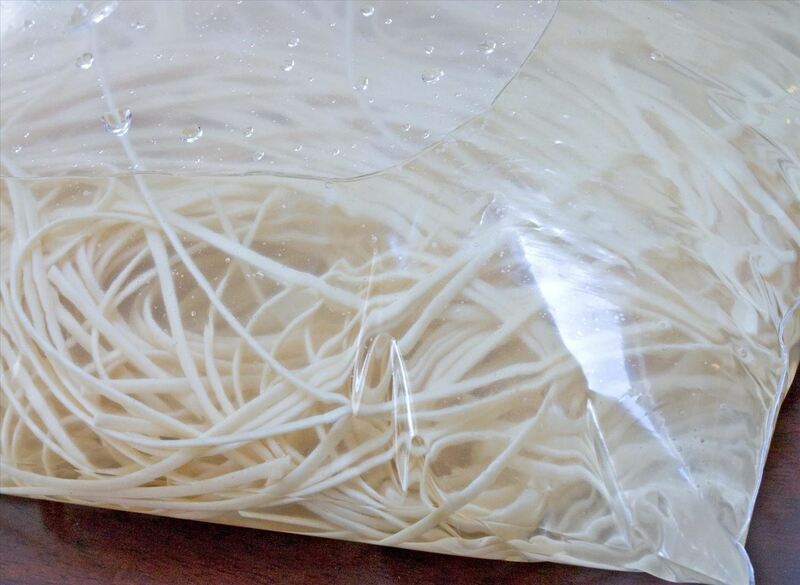 McGee says, "Because the noodles absorb water only very slowly at temperatures much below the boil, so little happens to them in the few minutes it takes for the water to heat up. 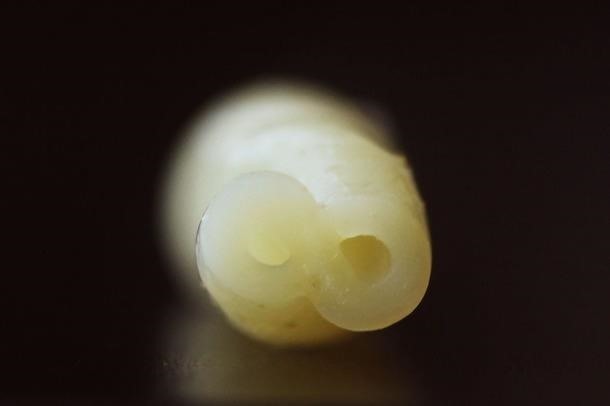 And no matter how starchy the cooking water is, the solid noodle surfaces themselves are starchier, and will be sticky until they're lubricated by sauce or oil." One caveat: when using this method to cook pasta, you do need to stir the noodles constantly so they won't stick. Get the full story here. 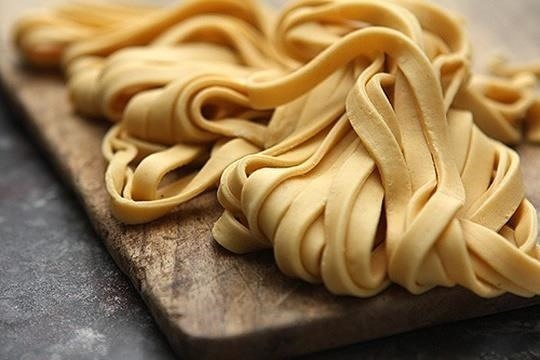 However, J. Kenji López-Alt of Serious Eats notes that cold water starts don't work very well with fresh pastas since they're made with eggs, and you need heat to ensure that they hold their shape and set properly. He also recommends skipping this method with long, skinny pasta shapes like fettuccine, spaghetti, and linguine, since they're more likely to stick together. What's your preferred method of cooking pasta? Great article! Any tips on orecchiette? I've wasted quite a few batches so far by following the package cooking instructions to the letter but they always end up stuck together like crazy. I'm afraid to try again. :( Any advice would be welcomed! Does this tip apply to any other form of noodles? Wonderful tip if i might add.